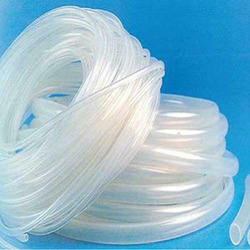 We are engaged in presenting an ultrapure gamut of Transparent Silicon Tubing. Unlike traditional peroxide cured silicone, platinum is free of ketones and peroxide improving clarity and taste, making it ideal for use in medical, food and drink and the dairy industry where non-tainting of the product is paramount. These tubes have been made from high quality material and are available in various sizes and colors. We offer these in various specifications as per requirements of our clients and offer at reasonable rates. Looking for Platinum Tube ?